A drunken man so frightens and embarrasses his grand children that they vow revenge. After some planning and a short wait for the perfect moment young Asger seizes his chance and pees into his grandfather’s beer before serving it to him. His sisters both laugh as they all watch their grandfather pick up his glass and take a healthy, full drink. Unable to contain himself, Asger blurts out what he has done, victorious in his revenge. Grandfather clutches his chest in pain and passes out leaving the children horrified with the thought that their revenge has killed their grandfather. Though Doghead by Morten Ramsland deals with many serious issues, it is a comic novel. Grandfather survives his grandson’s revenge and continues to wreck havoc on his family for many years. Doghead is a comic novel in the same vein of Gunter Grass’s The Tin Drum. Although Doghead will produce many laughs, just as in The Tin Drum the laughs come with a price tag. As the book opens, the narrator’s grandmother Bjork has begun sending him postcards. Ten years earlier, Asger left the family home in Norway for the life of a painter in Amsterdam. He thought he had escaped his family until his grandmother’s stories began resurfacing. Is what she tells him the truth? It all goes against much of the family’s accepted beliefs about itself and about Asger’s grandfather. For as long as any of them can remember they believed he was a war hero. A survivor of Auschwitz who managed to find his own way back home after escaping, Grandfather Askild struggled to find work as a ship designer though no ship builder could ever understand his Cubist influenced designs. Now, approaching her own end, Grandmother Bjork tells Asger that his grandfather was far from a war hero. Instead he was a scoundrel who made a fortune on the black market before the Nazi’s finally caught him for what was genuine criminal activity. All his life he was a frustrated painter, incapable of putting the visions in his head onto canvas. He abused his wife and his family, alienated the rest his own relatives and drank away most of the little money he did earn by trading off his reputation as a war hero and concentration camp survivor. Asger tells his own story along with his father’s and his grandfather’s in an attempt to finally confront all of the family’s long kept secrets and the childhood monster who has haunted him all his adult life, the monster he called Doghead. The resulting novel is as serious as the above description probably sounds, but it’s also very funny. Mr. Ramsland has an inventive humor that walks right up to the border with magical realism found in The Tin Drum but never quite enters it. The resulting novel is excellent, all the same. 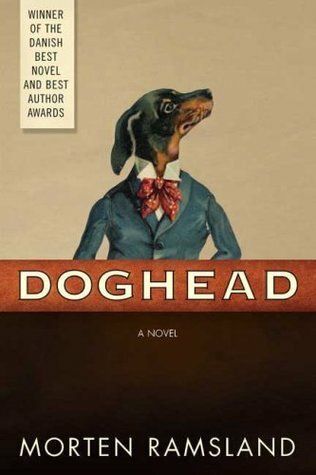 Doghead has won several prizes in the author’s native Denmark. I look forward to more by Mr. Ramsland soon. In the years since I first ran this review on my old blog, Ready When You Are, C.B., not only have I not read more by Mr. Ramsland I have completely forgotten nearly everything about Doghead. It does sound like something I would like, though. it happens like that doesn’t it – you find an author you enjoy and think you will read more of their work but then it goes into best intention land, Unlikely to return for a long time.